Is it safe to grow edible plants in a raised planter installed directly on asphalt? If soil is in direct contact with the asphalt, toxins may leach into the soil and be absorbed by the roots, so it would not be advisable to eat these vegetables. Ornamental plants could be grown in these raised planters with no modifications. Several options are possible for modifying the existing raised planters for safely growing edibles. With each of these options, soil from the existing raised planters should be removed before making modifications. Option 1. Drill drainage holes through the sides of the planter 2” from the bottom and 12-18” apart. Place a thick plastic liner in the bottom and 6 inches up the inside of the raised planter. Poke holes through the plastic where the drainage holes have been drilled through the planter. The plastic liner creates a barrier between the soil and the asphalt. Option 2. Drill drainage holes through the sides of the planter 1-1.5” from the bottom and 12-18” apart. Cover the asphalt and 6 inches up the inside of the planter with permeable landscape fabric. Add 2-3” of washed gravel on top of the fabric. The gravel will create a barrier between the soil and the asphalt. Option 3. Raise the planter up off of the pavement and create a bottom that would hold the soil, but allow water to pass through. The planter could be placed on bricks or have 2″ legs built on the bottom. Option 4. Mark the dimensions of the planter on the asphalt. Move the planter. Remove the asphalt within the footprint of the planter. Cover the newly exposed soil and 6 inches up the inside of the planter with permeable landscape fabric. Add 2-3” of washed gravel on top of the fabric. The gravel will create a barrier between the planting soil and the existing soil that was beneath the asphalt. In each case, after modifying the planter, refill the planter with new soil and replant. Will Allen of Growing Power (an Urban farming advocate in Milwaukee, WI) has some ideas for growing vegetables where there is literally no soil, such as on an asphalt parking lot. One solution for the center would be to use large plastic tubs, containers, or plastic children’s wading pools rather than a raised bed. Instead of drilling drainage holes in the bottom of the container (which could allow contaminants to leach up into the soil), drill holes just off the ground on the sides of the containers. 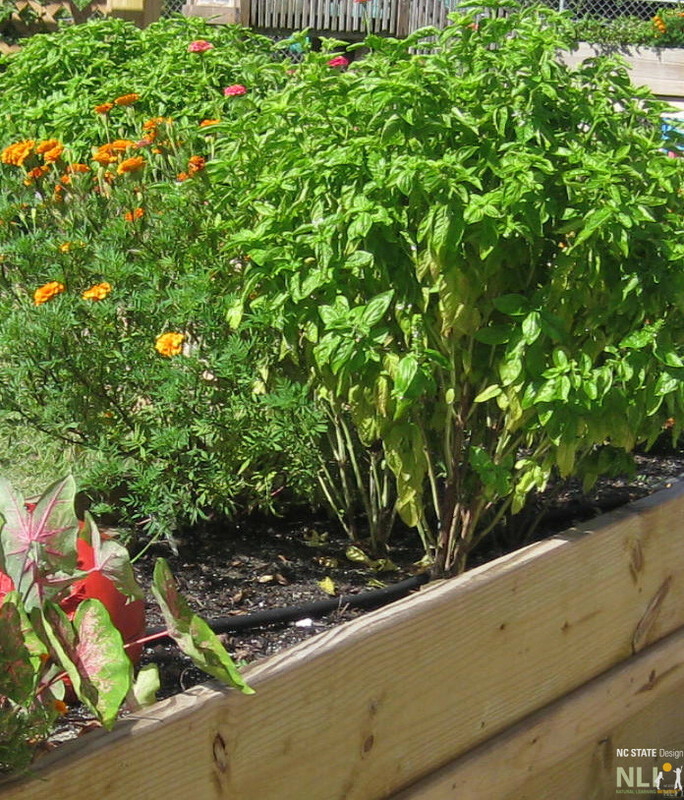 Herbs and marigolds thrive in a raised planter. 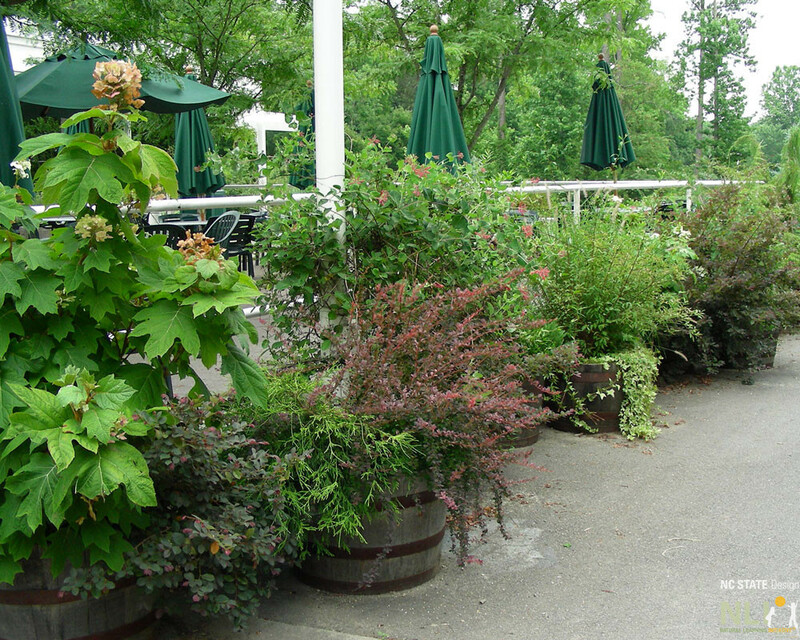 Shrubs and ornamental grasses thrive in large containers on asphalt at the Museum of Life and Science, Durham, NC. 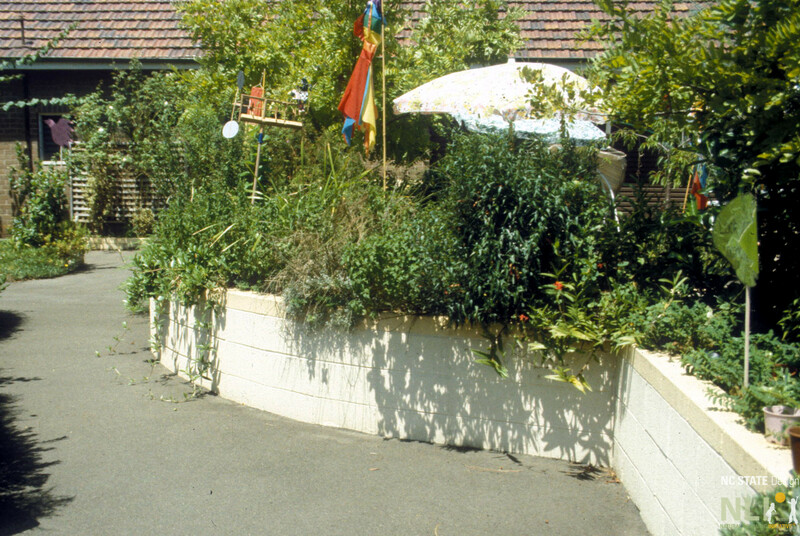 The asphalt was removed beneath these raised cinder block planters at the Lucas School, Australia.